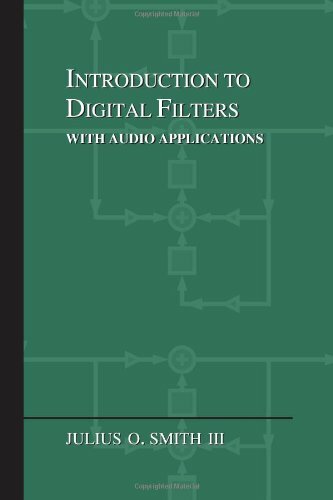 This chapter discusses minimum-phase signals and filters, the minimum-phase/allpass decomposition, and hybrid minimum-phase/linear-phase audio filters. Matlab code is given for computing minimum-phase spectra from spectral magnitude only. Note that minimum-phase filters are stable by definition since the poles must be inside the unit circle. In addition, because the zeros must also be inside the unit circle, the inverse filter is also stable when is minimum phase. One can say that minimum-phase filters form an algebraic group in which the group elements are impulse-responses and the group operation is convolution (or, alternatively, the elements are minimum-phase transfer functions, and the group operation is multiplication). The case is excluded because the polynomial cannot be minimum phase in that case, because then it would have a zero at unless all its coefficients were zero. Note that every stable all-pole filter is minimum phase, because stability implies that is minimum phase, and there are ``no zeros'' (all are at ). Thus, minimum phase is the only phase available to a stable all-pole filter. The contribution of minimum-phase zeros to the complex cepstrum was described in §8.8. and is the number of maximum-phase zeros of . We have thus factored into the product of , in which the maximum-phase zero has been reflected inside the unit circle to become minimum-phase (from to ), times a stable allpass filter consisting of the original maximum-phase zero and a new pole at (which cancels the reflected zero at given to ). This procedure can now be repeated for each maximum-phase zero in . In summary, we may factor maximum-phase zeros out of the transfer function and replace them with their minimum-phase counterparts without altering the amplitude response. This modification is equivalent to placing a stable allpass filter in series with the original filter, where the allpass filter cancels the maximum-phase zero and introduces the minimum-phase zero. A procedure for computing the minimum phase for a given spectral magnitude is discussed in §11.7 below. More theory pertaining to minimum phase sequences may be found in . Is Linear Phase Really Ideal for Audio? It is generally accepted that zero or linear phase filters are ideal for audio applications. This is because such filters delay all frequencies by the same amount, thereby maximally preserving waveshape. Mathematically, all Fourier-components passed by the filter remain time-synchronized exactly as they were in the original signal. However, this section will argue that a phase response somewhere between linear- and minimum-phase may be even better in some cases. We show this by means of a Matlab experiment comparing minimum-phase and zero-phase impulse responses. The matlab code is shown in Fig.11.1. An order elliptic-function lowpass filter  is designed with a cut-off frequency at 2 kHz. We choose an elliptic-function filter because it has a highly nonlinear phase response near its cut-off frequency, resulting in extra delay there which can be perceived as ``ringing'' at that frequency. The cut-off is chosen at 2kHz because this is a highly audible frequency. We want to clearly hear the ringing in this experiment in order to compare the zero-phase and minimum-phase cases. 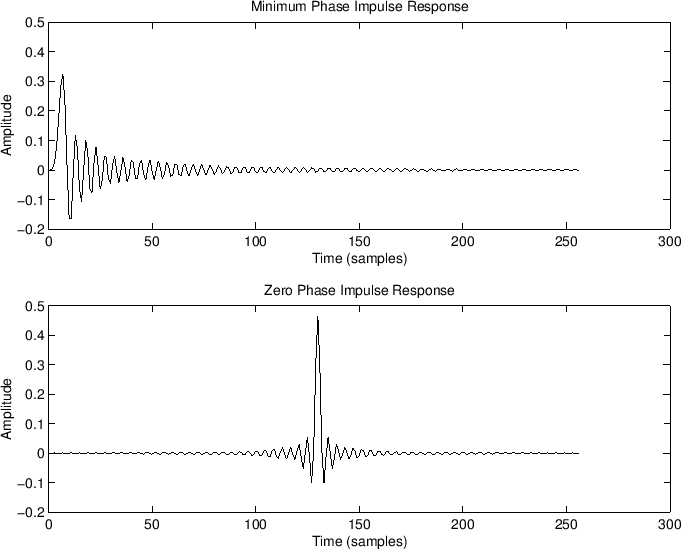 Figure 11.1: Matlab script for listening to minimum-phase and zero-phase impulse responses having the same amplitude response. Let the impulse response of the th order lowpass filter be denoted . It is neither minimum nor maximum phase because there are zeros on the unit circle. (An elliptic-function filter has all of its zeros on the unit circle.) However, nothing of practical importance changes if we move the zeros from radius 1 to radius , say, which would give a minimum-phase perturbation of the elliptic lowpass. again as discussed in §10.6. Since we are listening to a lowpass-filtered impulse, it is reasonable to define the ideal expected sound as a ``lowpass-filtered click,'' or some kind of ``compact thump.'' We may therefore ask which signal sounds more like a lowpassed click, or ? In the minimum-phase case, all filter ringing occurs after the main pulse, while in the zero-phase case, it is equally divided before and after the main pulse (see Fig.11.2). Listening tests confirm that the ``pre-ring'' of the zero-phase case is audible before the main click, giving it a kind of ``chirp'' quality. Most listeners would say the minimum-phase case is a better ``click''. Since forward masking is stronger than backward masking in hearing perception, the optimal distribution of ringing is arguably a small amount before the main pulse (however much is inaudible due to backward masking, for example), with the rest occurring after the main pulse. Figure 11.2: Minimum-phase and zero-phase impulse responses derived from two applications of an order elliptic-function lowpass filter. Figure 11.3 verifies that the magnitude spectra are the same in each case. 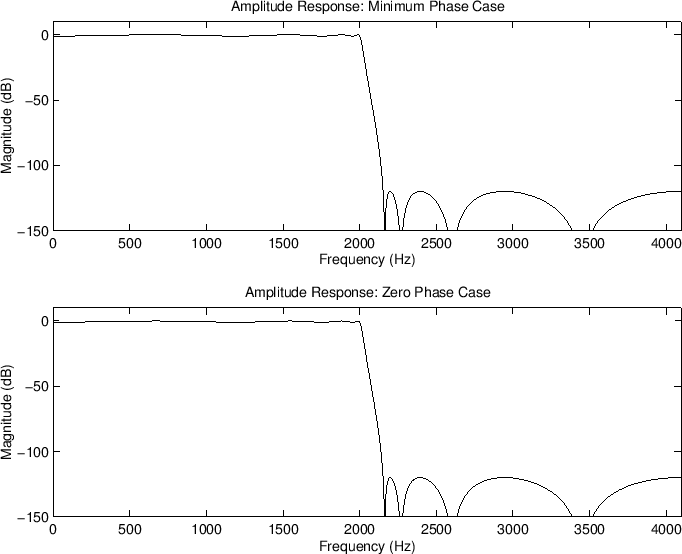 Figure 11.3: Magnitude spectra of minimum-phase and zero-phase impulse responses derived from two passes through an order 8 elliptic-function lowpass filter. Minimum-phase filter design often requires creating a minimum-phase desired frequency response from a given magnitude response ). As is clear from §11.5, any filter transfer function can be made minimum-phase, in principle, by completely factoring and ``reflecting'' all zeros for which inside the unit circle, i.e., replacing by . However, factoring a polynomial this large can be impractical. An approximate ``nonparametric'' method12.3is based on the property of the complex cepstrum (see §8.8) that each minimum-phase zero in the spectrum gives rise to a causal exponential in the cepstrum, while each maximum-phase zero corresponds to an anti-causal exponential in the cepstrum . Therefore, by computing the cepstrum and converting anti-causal exponentials to causal exponentials, the corresponding spectrum is converted nonparametrically to minimum-phase form. A matlab function mps.m which carries out this method is listed in §J.11.12.4It works best for smooth desired frequency response curves, but in principle the error can be made arbitrarily small by simply enlarging the FFT sizes used. Specifically, the inverse FFT of the log magnitude frequency response should not ``wrap around'' in the time domain (negligible ``time aliasing''). It is important to use something like mps when designing digital filters based on a magnitude frequency-response specification using ``phase sensitive'' filter-design software (such as invfreqz in matlab). In other words, poor results are generally obtained when phase-sensitive filter-design software is asked to design a causal, stable, zero-phase filter. As a general rule, when phase doesn't matter, ask for minimum phase. A related practical note is that unstable recursive filter designs can often be stabilized by simply adding more delay to the desired impulse response (i.e., adding a negatively sloped linear phase to the desired phase response). For example, the Steiglitz-McBride algorithm in Matlab (stmcb) is a phase-sensitive IIR filter-design function that accepts a desired impulse response, while Matlab's invfreqz (which can optionally iterate toward the Steiglitz-McBride solution), accepts a complex desired frequency response.